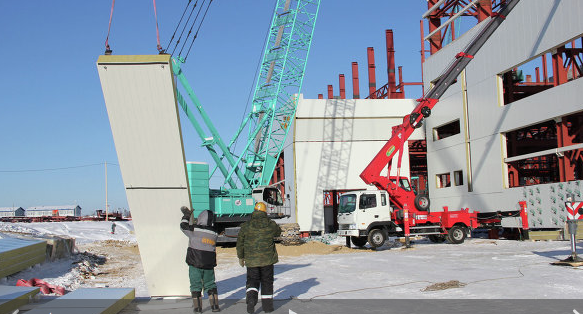 Work on Russia’s new Far Eastern Vostochny space center will be prioritized now that the Winter Olympics in Sochi has come to an end, a senior official said Monday while touring the facility. Deputy Prime Minister Dmitry Rogozin, who oversees the space and defense industries, toured the facility by helicopter and met with the Amur region governor and the head of the Russian space agency, Oleg Ostapenko. “Independent experts say that the manpower at Vostochny cosmodrome must be multiplied several fold, to 15,000 people at least,” Rogozin said. “The Olympics are over, now this facility is key.” During a report to the visiting officials, a manager of the project said that around 5,000 workers were currently engaged at the site, but that the number would be increased to 8,000 later this year. Rogozin said that the military’s construction agency should not only employ its own people, but also assign civilian workers from the build-up effort for the Sochi Olympics to the task. “A total of 5,000 people are working at the space center, and what, there are no people in the country?” Rogozin said. Managers reported that the facility was ready for the installation of nitrogen and oxygen processing plants following the completion of the site’s electrical network. Officials had earlier said that last summer’s excessive rainfall and the frosty conditions this winter had added to delays in the facility’s completion, which is scheduled to launch its first rocket next year and come fully online by 2020. Vostochny will host the country’s new Angara rocket and will help to reduce its reliance on its main Baikonur space center in Kazakhstan.